Home > Resources > Backup Samsung > How to Backup Samsung Galaxy S9/S8 on Computer? From downloading their favorite apps to saving phone numbers of friends and family members, Samsung Galaxy S9 and other mobile devices are idea for a number of different reasons. One of the best ways to backup your data and information on your Samsung Galaxy S9 is saving them on your desktop computer. Why Is It Necessary to Backup Galaxy S9 on Computer? - Preemptive measure to protect the data that the user needs. 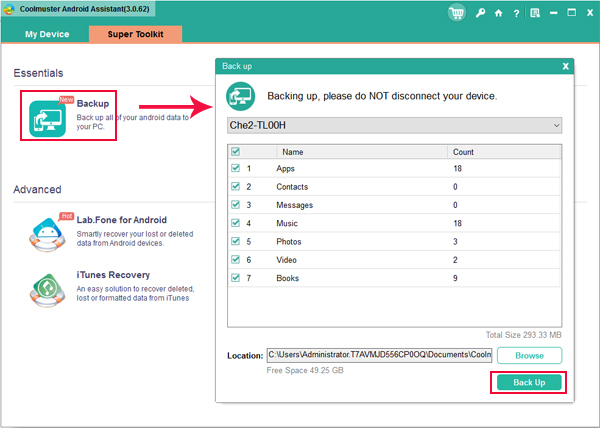 - Backup will allow the user to access the same data on their phone and their computer too. - Backup is needed to assist the user when they have inadvertently deleted info that they really need. Then, how to backup Samsung Galaxy S9 on computer? In some cases, picking up a handy phone to phone transfer tool will walk the person all the way through the process easily. In the following part, we show you two useful tools to backup Samsung Galaxy S9 on computer safely and easily. 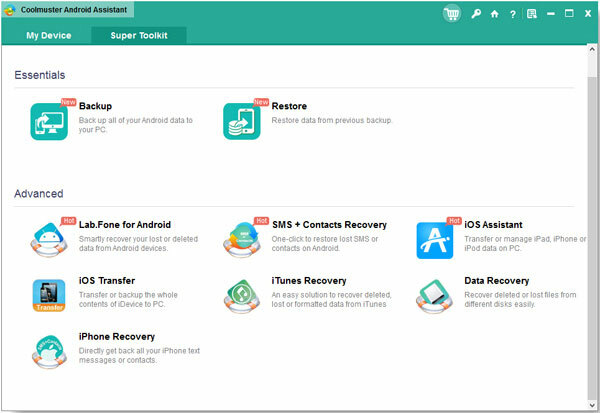 Coolmuster Samsung Manager is a wonderful data backup and restore tool for Android smartphone users. 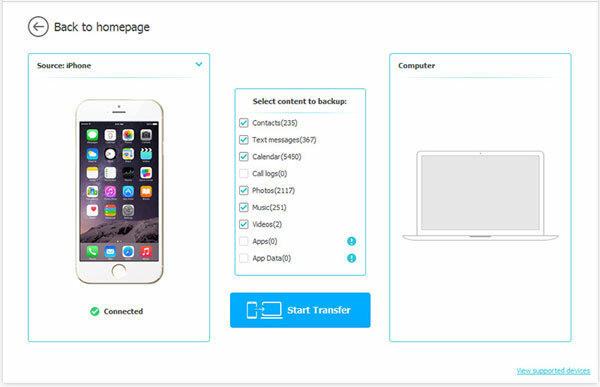 It supports to transfer contacts, text messages, photos, videos, music, books, apps and more files from Samsung Galaxy S9+/S9/S8+/S8/S7/S6/S5/Note 8/Note 7 and other Android phones to computer with several clicks. Launch the program on your computer and connect your Galaxy S9 or S9 Plus to the computer through USB data cable. The program will detect the device and show it in the primary window. Choose Super Toolkit from the top menu. You will see there are two essentials are displayed here. Just choose the "Backup" tab and there will be a new dialog popping up, allowing you to choose what types of files you want to backup. After selecting all the file types you need, you can click "Back Up" button to export them to your computer. By the way, if you need to import files from computer into your Samsung Galaxy S9, you can click the "Restore" button on the interface. The transfer process won't alter or damage your file quality. 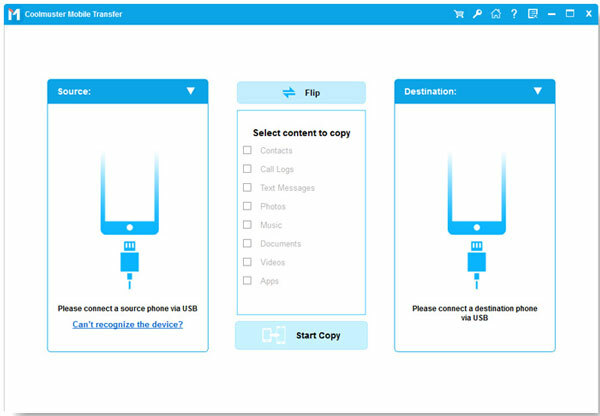 You can also use the Coolmuster Samsung Transfer to backup Samsung Galaxy S9/S9 Plus to computer with 1 click. The file types that are supported by this program includes contacts, SMS, photos, call logs, calendar, videos, music, apps, etc. The program also provides an easy way to make phone to phone data transfer. To start with, download and install the Samsung Transfer on your computer. Launch it to show the primary window on the computer. Choose the first "Back Up Your Phone" mode from the interface. Connect your Samsung Galaxy S9 on the computer and you will see the next window like below. Now, you can select content you want to backup and click "Start Transfer" button to export the selected files to computer. Done! You've successfully backed up Galaxy S9 data on computer. Both of the tools above are simple and efficient to use. Just pick up the one your are interested in and try it by yourself.